Since it is getting closer to Christmas, I thought I’d share a favourite Christmas square recipe with you. It’s a recipe that I found once on the City of Nanaimo website and then adapted. The recipe has a purpose though, too. 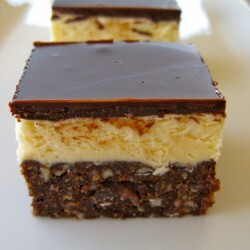 Nanaimo Bars have layers, and they’re a bit finicky to make. Writing a novel is nothing like making Nanaimo Bars—you can easily make them in an hour or so—but it’s those layers that I keep thinking about. So I have a question for you: how do you successfully add in layers of complexity to a story without going too far? Melt first 3 ingredients in top of double boiler. (Or just use two pots one big, one little. Fill the big one with water and put the little one in so that it floats…we’re not fancy in my kitchen). Add egg and stir to cook and thicken. Remove from heat. Stir in crumbs and coconut. Press firmly into an ungreased 8″ x 8″ pan. Note: I usually double the recipe for the second layer to get more cream filling. Melt chocolate and butter over low heat. Pour over second layer and chill in refrigerator (make sure the chocolate isn’t scalding or it will melt the cream).